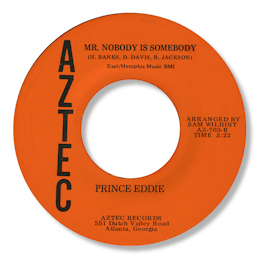 Both sides of Prince Eddie’s Aztec 45 from Atlanta, GA are covers – “Let A Woman Be A Woman” from Dyke & The Blazers, and Mr Nobody Is Somebody which was first recorded by Johnnie Taylor in 1969. But judging by the fact that Eddie makes the same mistakes with the lyrics as Z Z Hill does, my guess would be that it is his recording from 1975 that he’s following. Whatever, the song is a really good one, and Eddie gives it his very best shot, full of feeling accompanied by a busy drummer and twin tenor saxes, who play some fine riffs. Love the rap in the middle where he’s egged on by his background singer, and the screaming finish. 1. The Prince Eddie on New York’s Skytone is a different artist. I would assume that the guy on the same city’s Mona-Lee label is another artist as well. Can anybody confirm? 2. I have a note that a Prince Eddie also cut a version of “The Only Time You Say You Love Me” for the 77 label (not the John Richbourg company) – does anybody have details of this?